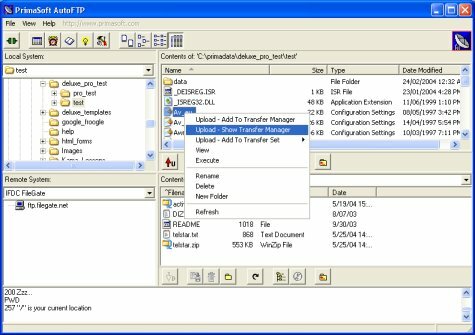 Main screen is divided into four sections: local computer panel (displays folders on a local computer), local folder panel (displays content of the selected folder on a local computer), remote computer panel (displays folders on a remote computer-ftp server), remote folder panel (displays content of the selected folder on a remote computer. Main screen allows you to quickly define transfers (downloads or uploads) of the selected files. To define transfers you can use drag-and-drop feature, download or upload buttons, or commands from pop-up menu.